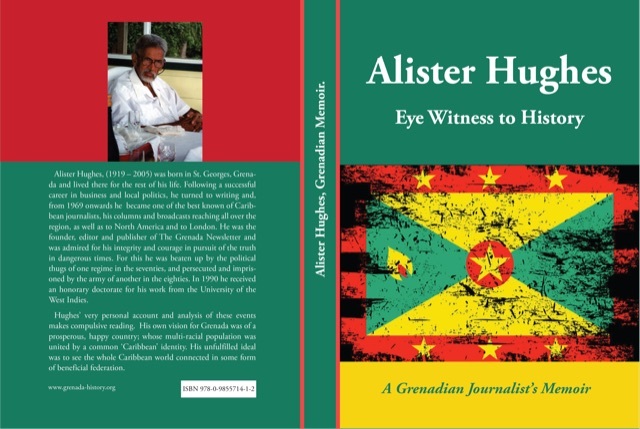 Alister Hughes, (1919 – 2005) was born in St. Georges, Grenada and lived there for the rest of his life. Following a successful career in business and local politics, he turned to writing and, from 1969 onwards he became one of the best known of Caribbean journalists, his columns and broadcasts reaching all over the region, as well as to North America and to London. He was the founder, editor and publisher of The Grenada Newsletter and was admired for his integrity and courage in pursuit of the truth in dangerous times. For this, he was beaten up by the political thugs of one regime in the seventies and persecuted and imprisoned by the army of another in the eighties. In 1990 he received an honorary doctorate for his work from the University of the West Indies. Hughes’ very personal account and analysis of these events makes compulsive reading. His own vision for Grenada was of a prosperous, happy country; whose multi-racial population was united by a common ‘Caribbean’ identity. His unfulfilled ideal was to see the whole Caribbean world connected in some form of beneficial federation. To download a copy, please click on the image below. In addition to this online and downloadable version of Alister’s memoir, there will also be a softcover printed version of the memoir with the ISBN code of 978-0-9855714-1-2. Watch this space and other online social media in the WestIndies [sic] for price and ordering information. This web site was published and promoted by Margaret and Alister Hughes for the people of Grenada, in the hope that the stories recounted here will help to restore the heritage of Grenada to all. This is a site for all Grenadians and well-wishers. We invite the active support and assistance from all Grenadians and wellwishers in order to preserve, defend and promote the heritage of the country. This website is a work in progress, and we ask your help in making it more and more useful in restoring heritage resources available to the people of Grenada. Give us feedback on what you find here---AND on what you WANT to find by sending Margaret Hughes an e-mail (click HERE). We're free. It's a new day which now has begun. To foster the growth of Caribbean Man. Who fought for the birth of Caribbean Man. To fight for the rights of Caribbean Man. He called for the vote for Caribbean Man. Though trampled, be proud of Caribbean Man. The basics, no more for Caribbean Man. In no way included Caribbean Man. A synthetic Limey, Caribbean Man. Not yet do we know we're Caribbean Man. For they too, my friend, are Caribbean Man. Is what must develop Caribbean Man. Can now be our Mother, that can't be our plan. To ape the ex-masters with jacket and tie. Of suitable dress for Caribbean Man ? Awake and move forward, Caribbean Man. !!! And this is Alister's "Explanatory Note" --- the page numbers refer to Alister's original typescript of the poem. Cover Logo and word "CARICOM" refer to the Caribbean Community and Common Market, the grouping of Britain's ex-West Indian colonies. Page 1, verse 3 Paul Bogle a former slave in Jamaica, led an armed protest uprising (riot) in 1865 against injustices to ex-slaves in that country. He was tried and hanged. George William Gordon, also born a slave, a mulatto, educated himself and became a wealthy influential landowner. He was a member of the Jamaica House of Assembly and used his position to try to get better conditions for the ex-slaves. He took no part in the riot but, because he was known to be a friend of Bogle, he was tried, with no opportunity to defend himself, and was hanged. Page 1, verse 4 Hubert Critchlow formed the British Guiana Labour Union in 1919, the first registered trade union in the dependent British Empire. This came in the midst of serious labour unrest in British Guiana and, championing the workers cause, Critchlow was dismissed from his job. Page 1, verse 5 William Galway Donovan, Grenadian, newspaper-editor, patriot, lived late in the last century, and is well known for his principle that "A naked freeman is better than a guilded slave". He had the vision of a united Westindies. He went to jail rather then withdraw his public criticism of what he considered to be an unjust decision of a corrupt Judge. Page 2 verse 1 Theophilous Albert Marryshow (1887-1958) was a protégé of Donovan and inherited the drive for a united Westindies. He is known as the "Father" of the West Indies Federation which, born in 1958, died in 1961. Page 2, verse 4 C.B.E., (Commander Of the British Empire), an honour conferred by the Queen of England. Page 3 verse 1 Natives of Britain's colonies had no vote in Britain and were, therefore, more "objects" belonging to the Queen than her "subjects". A calypsonian, ridiculing a totally unsuitable and inadequate booklet specially produced for the education of children in the colonies, used, in his song, a line from that booklet, "Dan Is The Man In The Van". Page 3 verse 4 Julien Fédon led an unsuccessful revolution in Grenada in 1795. Toussaint Louverture and Henri Christophe were leaders of the Haitian revolution in 1791. Quamina was the leader of a slave up-rising in British Guiana in 1823. Cuffie was the leader of a slave up-rising in British Guiana in 1763. Cudjoe was one of the leaders of a slave conspiracy in the Virgin Islands in 1759. However, he violated security and the slave owners were able to avert an up-rising. Page 4 verse 5 and page 5 verse 1 With the breaking of colonial ties to the "Mother Country", Britain, there has been an unfortunate tendency of some Westindians to seek Africa as a "Mother Country". Page 5 verse 2 John Canoe, a Christmas traditional street dancing in Jamaica. Big Drum, a traditional dance routine in Carriacou, Grenada's sister island. Anansi and Tigue, traditional folk tales. Lajabless, a supernatural figure in folk lore. Page 5, verses 3 and 4, Self explanatory.